The exclusively Microgaming-powered 32Red online casino is a favourite gambling destination for Canadians. The casino originally launched back in 2002 and offers several dedicated gaming options. These dedicated gaming options are designed to cater to the needs of various regions around the world. 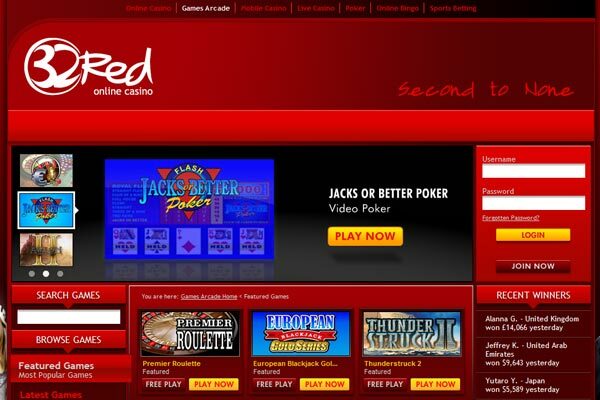 Currently, 32Red offers dedicated sites for gamblers from the United Kingdom, Australia and Canada. To further enhance the top quality digital gambling experience, 32Red offers a range of options including a live casino, mobile casino, online sportsbook, a dedicated bingo site, and a dedicated poker site. As with all of the 32Red dedicated options, the Canadian version of the 32Red brand offers all of the above gambling options. The main difference of course is that Canadians may enjoy playing and banking in CAD, along with customer support in both English and French. 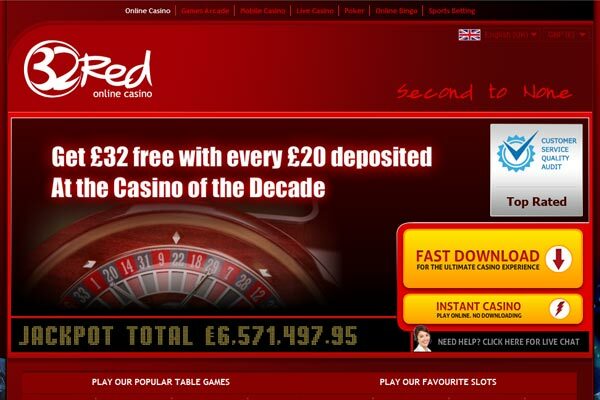 32Red offers well over 500 of the best Microgaming casino games available. At least 300 of these consist of slots and progressive jackpot games with the remainder divided into various table, card and specialty games. 32Red Casino is licensed and regulated by the Gibraltar Regulatory Authority as well as by the UK Gambling Commission. While many of today’s online casinos tend to go with multiple software providers, there is a lot to be said for sticking with a single source brand. 32Red Casino is solely powered by Microgaming, and presents a powerful and cohesive digital gaming platform. Microgaming is also one of Canada’s most popular online casino software brands. Microgaming is the original digital casino brand and, many Canadians feel that the Microgaming name is the most reliable and trustworthy of all. As such, 32Red currently offers over 500 of the best Microgaming casino games that the brand has ever produced. More than half of these are slots, arranged into classic 3 reel slots, modern 5 reel video slots, and of course, Microgaming’s famous progressive jackpot slots. 32Red also offers a range of non-slot format games which includes a range of table and card games, some with Live Casino versions. These include roulette, blackjack, baccarat and poker games. Fans of online table poker or online bingo, can also visit 32Red’s dedicated online poker and bingo sites, all from the same single user account. Canadians looking to sign up with 32Red Casino to play their enviable range of Microgaming casino games can look forward to a Welcome Bonus of up to CA$160. While not the biggest sign up bonus of any Canadian online casino, the 32Red Casino bonus will nevertheless be a good boost to your initial casino campaign. The 32Red Welcome Bonus works on every CA$20 that you deposit and Canadians can expect to get at least CA$32 on top of every CA$20 that they deposit. The bonus boos only applies to their Welcome Bonus deposits and not to any subsequent deposits. For this there are separate bonus offers to supplement additional real money deposits. The 32Red Welcome Bonus does come with certain wagering requirements, also often referred to as play through contributions. 32Red expects all Canadian players who decide to accept the Welcome Bonus offer, to wager their bonus amount at least forty (40) times. This requirement must be completed before any requests to withdraw winnings can be submitted to the casino. Any attempt to request a withdrawal before the wagering requirements have been completed will result in an automatic removal of bonus money as well as any winnings accrued with bonus money from your account. 100%: Scratch Cards, Slots and Keno. 50%: Table Poker games, Sic Bo, Casino War, Roulette games (besides French Roulette). 10%: Vegas 3 Card Rummy Gold, Caribbean Draw Poker, Pontoon, Blackjack, Video Poker (except All Aces) and Baccarat. 2%: Certain versions of Blackjack, Texas Hold’em Bonus Poker Gold, Hi Lo 13 European Blackjack Gold and All Access Video Poker. 0%: Mega Progressives (Double Magic, Major Millions, High 5 and Fantastic 7s) including Castle Builder and Craps. The 32Red brand of digital gambling covers a great deal of ground and also includes a mobile-friendly casino platform. This allows Canadians looking to enjoy top online gambling on the go, access to 32Red Casino’s myriad of gambling options including their online poker and bingo sites, as well as their live casino and sports betting options. As with its main desktop platform, the 32Red mobile casino is powered by a single software brand, Microgaming. This allows for flawless continuity between the brands various options. Canadians can enjoy most of their favourite Microgaming casino games including top slots and progressive jackpots such as Mega Moolah, Dark Knight, Major Millions and Cash Splash. Top slots on offer including Tomb Raider, Thunderstruck and many others. 32Red Mobile is fully optimised for both smartphones and tablet devices, across all popular operating systems including iOS, Android, Blackberry and Windows Phone. A nice additional feature that 32Red make available to mobile casino gamers, is a games request service. This means that, if you cannot find your favourite Microgaming on their mobile platform, you can simply request the game via text message. 32Red support will then send you the link to that specific game. Another useful feature is that you only need a single account to access all of 32Red Casinos offerings, this includes the mobile platform as well poker, bingo and sports betting. Canadians can also enjoy total mobile safety and security, which allows for easy deposits and withdrawals on the go as well as total control over all account features. 32Red Casino offers a range of additional promotions and rewards over and above the initial sign up bonus. Canadian players can look forward to enhanced gaming with daily and weekly reload bonus offers as well as rewards for frequent play. 32Red offers a loyalty rewards program known as the Ruby Rewards Loyalty program. The program works in a very similar way to other standard points or cashback programs and is based on playing frequency. The more players bet on the various 32Red gambling platforms, the more points they stand to earn. Players can then convert their points back into real casino cash which adds a welcome boost to any player bankroll. 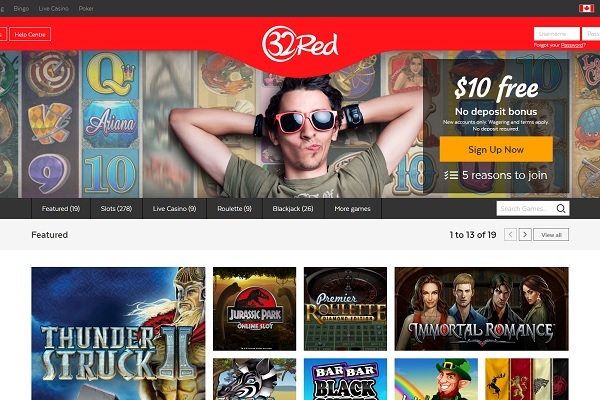 32Red Casino offers Canadian players comprehensive and multilingual support. Customer support is professional and friendly and is accessible 24 hours a day. Players can contact the 32Red team throughout the year via a number of convenient communication channels. This includes a Live Chat option, accessible from every page of the casino, an email contact form option, landline call support and Skype support. New players can also reference the casinos expansive FAQ section which answers all of the most common issues and queries. There are quite a few Canadian-friendly payment options available through the 32Red cashier, making it quick and easy for Canadians to make deposits and withdraw their winnings in CAD. While the standard options such as Visa and MasterCard are available, Canadian favourites such as InstaDebit, PayPal and PaySafeCard are also represented. Generally speaking, the 32Red cashier processes all withdrawal requests within 24-48 hours. Withdrawal limits are also generally limited to around CA$120,000 per day. 32Red Casino is an excellent choice for Canadians looking for two specific things in an online casino. On the one hand is an instantly recognizable brand with an excellent track record and a dedicated Canadian portal. On the other is the fact that this casino exclusively uses Microgaming software right across the board. The use of Microgaming, the oldest online casino software brand in the world, extends to their mobile and live casino options as well. For good measure 32Red also offer an excellent online sportsbook, poker and bingo sites, all accessible from a single user account. Finally, the brand also offer comprehensive, professional and friendly 24 hour support of all online casinos, a high level of online safety and security, and a solid bonus and rewards program for all Canadian players.